The shine of a brand new title for the Giants has barely begun to dim as we are all forced to look ahead to next season and beyond. In years past it always felt like there was a break between the end of the World Series and the beginning of player movement via free agency, trades, and whatnot. Now, it's less than 2 weeks after the San Francisco Giants won their 3rd title in 5 years, and we have to talk about the free agency of Pablo Sandoval. Hope you enjoyed celebrating that title because suddenly it's back to business in the world of baseball. General managers of all the teams are meeting this week in Phoenix. It's not specifically designed for the free agent shuffle, they are there to conduct league business and review things from the previous season. That's what's supposed to happen. In years past it has been the Winter Meetings that have been the place for activity. Now the GM meeting lays the ground work for some off season action. This is the reason Sandoval and his agent Gustavo Vazquez are going to Phoenix this week. To talk to other teams. It's been reported that other than the Giants he is being sought by the Blue Jays, Red Sox, and White Sox. Does the fact that nothing but AL teams are reported to be interested stick out to you as well? That's startling and means that folks outside of Giants land have serious questions about Sandoval's ability to stay in shape and on the field. In the past I have raised those same concerns myself. Looking back I was surprised to see that Sandoval has missed less time than I imagined. Still, none of the other teams in the NL seem to want to add him to the hot corner. There's already talk of turning him into a DH during the later years of a deal with an AL club. I think the DH talk needs to go away until his next contract comes around. He recently turned 28 years old. By the time a 6-year deal runs out Pablo will have just turned 34 years old. His defensive skills are no longer a worry. I think he could play at least 6 more years in the field, maybe more. 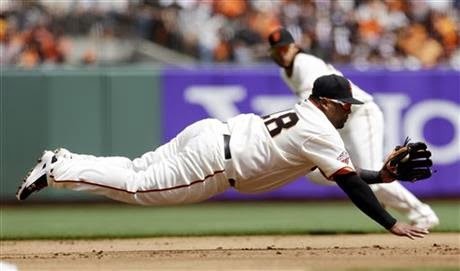 It's widely known that Sandoval is looking for a 6-year deal but other reports say that he would be flexible. He's got his brother as his personal chef and has apparently retained a personal trainer to work with him until he retires. Sandoval has played 141 games or more in 4 of his 6 full seasons in the majors . His career high was this past season when he got in to 157 games. Those other 2 seasons? That would be 2011 and 2012. In each of those seasons he played over 100 games. There's also the point that those are the 2 seasons he was named an All-Star. I don't know what that point is, but it's there somewhere. Also, the other side of it. The way Sandoval came through in both the 2012 and 2014 championship runs cannot be overlooked. It happened, and should be used as a measuring tool. I know. The old thinking is "what if they never get there again?". Well you should just throw that thinking right out the window. With the machine that has been built by Brian Sabean, this team will contend for years to come. I mean, he could just as well decide to take an offer somewhere else and coast for the rest of his career. But that wouldn't make him legendary or even Hall of Fame worthy. Staying with the Giants could do that for him. I think his appetite is to perform in the spotlight more than anything and Sandoval knows the brightest lights are in October. Pablo thrives under pressure and delivers for himself and the team. He sees that helping the guy next to him helps himself. He'd be foolish to walk away from San Francisco, and with all that money the Giants will rake in from this 3rd title, they can afford to bump payroll a little bit. There's only one way to keep chipping away at history for Sandoval and the Giants, if they keep doing it together. Note: We recorded the World Series Champs podcast last week. If you haven't checked it out yet click on over to Torturecast.com and have a listen to Episode 77. It's fun to talk about championships. Ultimately, though, Pablo is in the driver's seat, if he wants to go for six years. DH or not, the Giants aren't going to do it, UNLESS they were to build a wight clause into the deal. Then, who knows? Good read!